View basket “Syringe Highlighters all 7 colours” has been added to your basket. Comfortable to write with and fits nicely in your hand. Medinc satisfaction guarantee, if you are not 100% satisfied with your item contact the seller within 30 days of purchase for a full refund and free return. 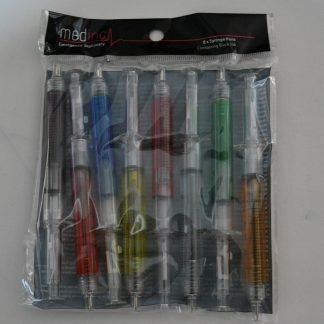 The Medinc 5 Syringe Highlighters comes in 5 different colours. The colours are blue, green, yellow, orange and pink. Easy to hold. Perfect size for fitting in your pocket. Ideal for a medical student. Perfect for a nursing student. 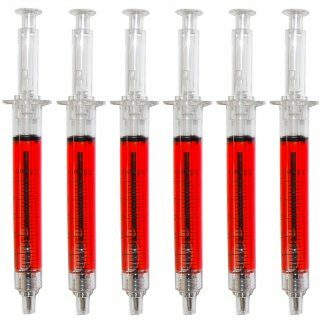 If you normally have problems with holding onto your pen then you need these 5 syringe highlighters. It is almost impossible for someone to hide when they steal these syringe highlighters. You should also be aware that some people are more likely to attempt to run away with your syringe highlighters. It is therefore recommended that you keep an eye on your syringe highlighters at all times. 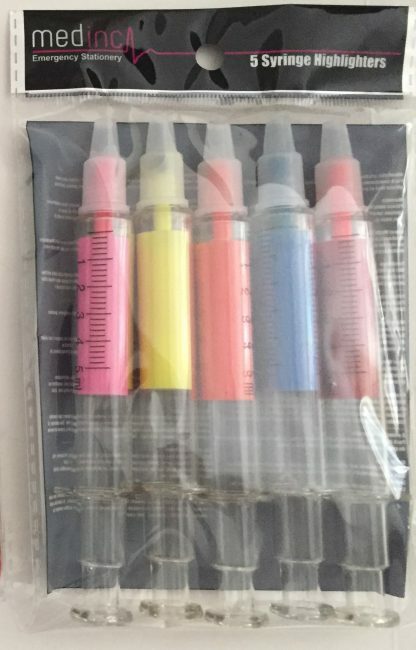 5 Syringe Highlighters in each of the different colours. Colour are Yellow, Green, Blue, Pink or Orange. The Syringe Highlighters are not a medical device and should not be used in emergency situations. It is strongly recommended that you do not attempt to ‘inject’ yourself with the syringe highlighters as it may cause injury. Please also be aware that using the syringe highlighters in public may cause distress. Some people find it hard to differentiate between an actual syringe and the syringe highlighters. It is therefore recommended that you explain the syringe highlighters to those around you before using it. Those of a sensitive nature can be offended by this item, please be considerate of their feelings. Gift Wrap Why not wrap this in some of our Medical Gift Wrap (Click here) and Medical Gift Tag. Study Aid? Then maybe consider one of our Pharmacology medical notebooks. Looking for a pack of syringe pens? We have the pack of 6 Syringe Pens in packaging. If you like these then consider our Sister Science Gift Site Atominc.co.uk.